A manuscript is essentially the earliest draft of a book. It is the unpublished version of a book submitted to agents and editors for publication consideration. In book publishing, agents and editors will often refer to books in manuscript form, noting that the book is in the earliest stages of preparation. A book in manuscript form will always need to be edited. And, sometimes, once the editor has gone through it, it is sent back to the author for a rewrite. Either way, it will likely be sent back to you once it's been edited and proofread so you can make the requested changes. Once it is deemed to be fully ready, it is then sent to the production side of the business, where it is prepped to be printed into an actual book. Some authors begin work on their manuscript without first having had a book proposal accepted by a publisher. They write first, then look for a publisher. And if they can't find a publisher, they self-publish. Other authors only begin to work on the manuscript once a book proposal has been accepted by a publisher. When you are composing your book, many people recommend not worrying about the format. You can compose your manuscript writing longhand with a quill on parchment if that's what gets your creative juices flowing. There are still writers who use paper and pen, typewriters. or record their manuscripts verbally before transcribing it or having it transcribed for them. Bestselling author Danielle Steel has written more than 100 books—all on her trusty 1946 Olympia manual typewriter. However, it is probably safer to compose using a computer and word processing program so your work is saved and won't blow away in the wind. You also have the advantage of using spell checking and grammar checking. 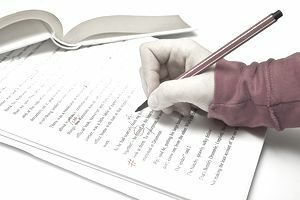 Whatever method you use to compose your manuscript, it must eventually be made to conform to the style guide and manuscript preparation guidelines required by the publisher. There may be different style guides and manuscript requirements for the type of books, such as fiction, nonfiction, children's books, scripts, and poetry. Ask the publisher or your agent for their guidelines before you submit your manuscript. Use one-inch margins on the top, bottom, and left- and right-hand sides. Numbering should begin on the first page following the title page. Each page should have a header with your name, the book title in all caps, and the page number. The entire text should be double-spaced, which leaves space for comments by editors. Indent each paragraph five spaces without adding extra lines between paragraphs. Use a standard font type such as Arial or New Times Roman in 12-point type. Printed manuscripts should be produced on 20-lb. bond paper. It is easy to reformat manuscripts you have saved in a computer compared to the days of old when you had to retype them completely. And speaking of saving, I can't stress enough the need to back up your work on a memory stick or external hard drive. That way, even if your computer's hard drive crashes, your work will be saved.